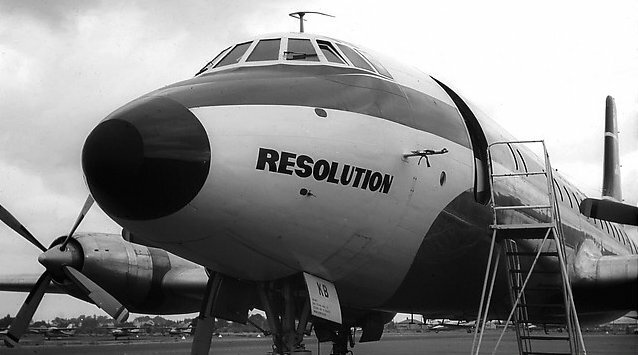 First flew 4th November 1957. This was the last Britannia built. Leased by Cunard Eagle Airways Ltd from Bristol Aircraft Ltd on the 1st May 1961. Damaged whilst taxing at Stansted on the 26th January 1968, repaired and sold to CCT Leasing after closure. "Good Fortune" "Endeavour" " Resolution" and "Equality"
Entered service November 1959 with Canadian Pacific Airlines as CF-CPE. Aircraft was returned at the end of the lease in 1961 to Bristol Aircraft Ltd.
Tellair of Switzerland had the aircraft from April to October 1969. It was then sold to Airline Engineering for spares and withdrawn from use and broken up at Bagington, Coventry in October 1971.